Insider: Omega Co-Axial Speedmaster Moonwatch 'Dark Side of the Moon' Black Ceramic. Weighing Only 91 Grams. 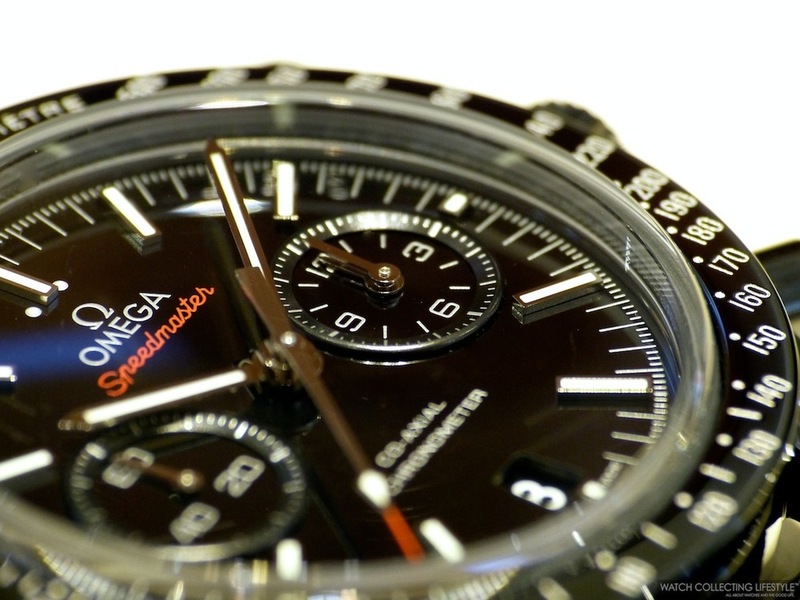 The Omega Speedmaster 'Dark Side of the Moon' was presented last year at Baselworld; however, almost a year later, it's still somewhat difficult to find at authorized dealers, the Tourbillon Boutiques or the Omega boutiques —even getting our hands on a 'press loaner' has been almost impossible. Every time one of these watches hits a boutique is gone within a few days or even hours. Luckily last week, we received a call from our friends at the Omega boutique here in Chicago —as they had just received one— and allowed us to do a quick review of the watch. As you all know, the Omega Speedmaster is one of the most iconic watches in the world, a watch that was originally launched in 1957 and that since its landing on the moon it has been awarded as the 'Moonwatch'. The Apollo 8 astronauts were the first people to see the dark side of the moon with their own eyes and the black ceramic Co-Axial Speedmaster salutes their pioneering spirit and pays homage to the Speedmaster Professional chronographs worn by every Apollo astronaut. This timepiece is the product of groundbreaking technologies and crafted from a single block of black zirconium oxide ceramic. The Omega Co-Axial Speedmaster 'Dark Side of the Moon' redefines the iconic design of the Moonwatch and its name evokes the mysteriousness and allure of space. This Co-Axial Speedmaster Moonwatch 'Dark Side of the Moon' in black ceramic ref. 311.92.44.51.01.003 is fitted with a case measuring 44.25 mm in diameter —just like the stainless steel and titanium models— and fitted with a rugged black coated nylon strap with red contrast stitching on the back lining and a black ceramic pin buckle. The black ceramic case on this watch is extremely light —total weight of the watch is only 91 grams— and very nicely finished with alternating brushed and polished areas. Its highly polished black dial features two counters with raised borders and silver/white numbers. The chrono-counter at 3 o'clock keeps track of the hours and minutes for the chronograph function, while the counter at 9 o'clock indicates the running seconds of the watch. A convenient and discreet date aperture is located at 6 o'clock with a black calendar disc with white font and the seconds hand for the chrono features a perfectly contrasting red tip that matches the red 'Speedmaster' imprint on the dial. The matte chromium nitride tachymeter scale is among the most identifiable design features of the Speedmaster and is engraved using state-of-the-art laser technology. The silver engraved numbers stand out from the polished ceramic bezel in a very nice way and the bezel is complemented by the beautifully done pushers of the chronograph. 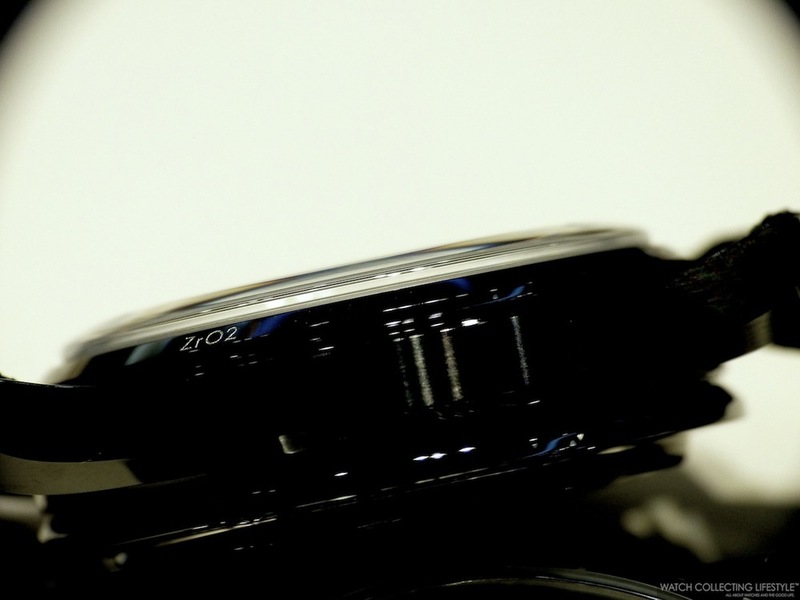 The crown rounds up the look of the watch with the Omega logo also engraved using the same technology. The watch features a display case back with a sapphire crystal that almost looks like a thick plexiglass but that is way more rounded and flatter than that on the stainless steel model —we have included pictures of the case back on both watches so you can see for yourself. 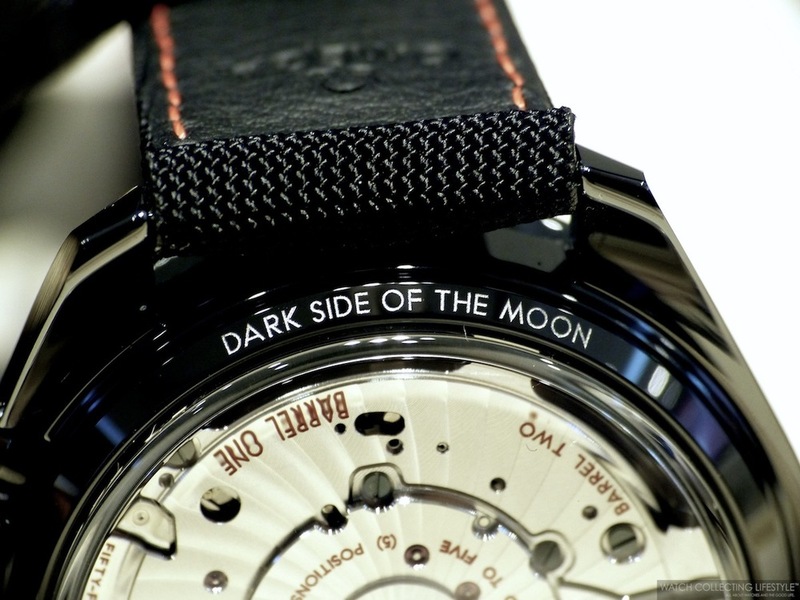 The case back also features a beautiful chromium nitride laser engraving of the words 'Dark Side of the Moon' that enhance the look of the back of the watch even more. The beating heart inside this new timepiece is the automatic in-house Omega caliber 9300 with a power reserve of 60 hours. This new Speedmaster 'Dark Side of the Moon' wears as comfortably as all other 44.25 mm Speedmasters and perhaps a little bit better as it is extremely light. On the wrist, the watch seems smaller than its actual dimensions due to the highly reflective black ceramic case but nonetheless with an outstanding wrist presence. Sticker Price $12,000 USD. For more info on Omega click here. 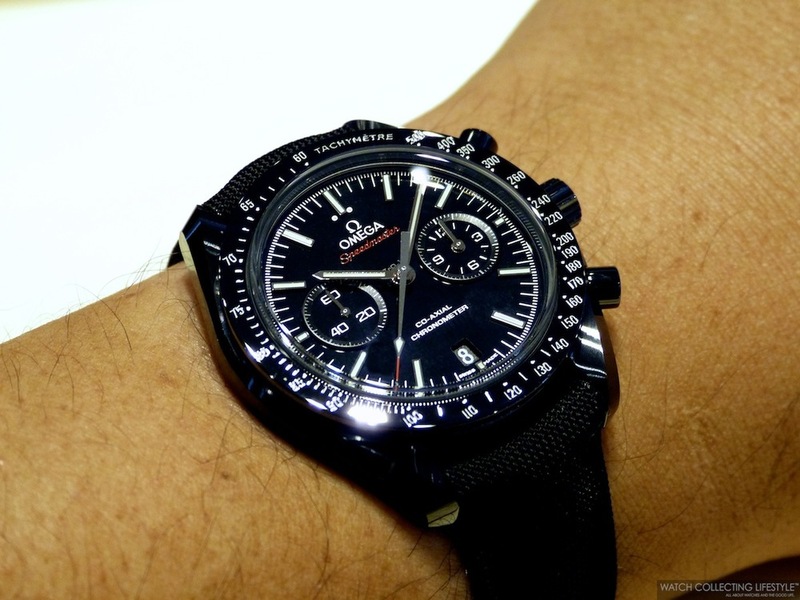 Posted on February 8, 2014 by Editor & Publisher and filed under Omega and tagged Omega Speedmaster Dark Side of the Moon Omega Speedmaster Black Ceramic Dark Side of the Moon Omega Speedmaster Moonwatch ref. 311.92.44.51.01.003 Omega Calibre 9300.